Robustness can be regarded as the ability of the SCC mixture to maintain both the fresh properties and composition pre- and post-casting of one batch or successive batches, due to the composition of the mixture and due to some small changes in the contents of the ingredients of the mixture. Robustness depends on a number of different attributes including the specific composition of the mixture, the mixing history, i.e. the shear energy and shear rate, and the specific application. SCC might be more susceptible to changes than ordinary concrete because of a combination of detailed requirements, more complex mix design, and inherent low yield stress and viscosity. Variations in properties (and robustness) are attributed therefore to the specific effects of the ingredients on the rheological properties of the mixture, effects of the physical properties (i.e., size and specific density) of the aggregate, and the mixing history. This article reviews all of these effects and indicates how these effects are likely to affect the robustness of the mixture. In addition, the effects of moisture variations and mixing devices on the fresh properties are discussed, and with examples provided on evaluating the robustness with a new segregation probe device. In a narrow sense, the term ‘robustness’ might be synonymous to stability, as the latter term refers to the ability of SCC to resist changes, i.e., segregation during transport and placement (dynamic stability) and post placement (static stability). In a broader and more practical sense, the term robustness that is adopted here describes robustness as the ability of a given mixture to maintain its fresh properties and uniformity during processing, casting, and due to some small changes to the composition of the mixture due to some small changes in the mixture’s ingredients contents. The term uniformity might be divided into two subcategories; (a) resistance to segregation because of the inherent composition of the mix, and (b) resistance to segregation because of processing that affects the rheological properties. Indeed, some properties, such as loss of fluidity and compatibility are frequently encountered with regular concretes. However, SCC might be more susceptible than ordinary concrete because: (a) the mix design is more complex as it contains more ingredients that each of them might affect the rheological properties differently, (b) SCC it is likely to be more thixotropic than ordinary concrete, and (c) the requirements from SCC are by far more demanding, thus what might be acceptable for ordinary concrete, might not meet SCC requirements. [i] Bonen, D. and Shah, S.P., “Fresh and hardened properties of self-consolidating concrete,” Progress in Structural Engin. Mater. J.,Vol 7(1) 14-26, 2005. [ii] Khayat, K.H., “Workability, Testing and Performance of Self-Consolidating Concrete,” ACI Materials Jr., Vol 96(3) 346-353, 1999. [iii] Khayat, K.H., Hu, C. and Monty, H.,” Stability of SCC, advantages and potential applications,” in RILEM International Confer. on Self-Compacting Concrete, Stockholm, Sep. 1999. A lack of robustness can be manifested in several ways that affects workability and the other assigned properties of SCC, i.e., flowability, passing ability, and stability. Following is a review of the effects of ingredients on the rheological properties that affect robustness. Tattersall and Banfill[i] and Banfill[ii] showed that the yield stress and plastic viscosity values are exponential functions of the water and superplasticizer contents, and the flow characteristics of the cementitious materials are related to structural buildup during rest and structural breakdown due to remixing. Roy and Asaga[iii] concluded that a change from the least severe to the most severe mixing procedure caused both the yield stress and plastic viscosity to decrease by about 60%. Similar results were reported by others. [iv],[v] More recently, Douglas, et al. [vi] showed that the structural buildup and thixotropy are also related to the superplasticizer content, rest time, and mixing energy. Cyr, et al. [vii] have shown that different superplasticizers and mineral admixture affect differently the rheological properties including shear thickening. Accordingly, the shear thickening is increased in the presence of metakaolin, ground quartz and fly ash have no effects on it, whereas silica fume reduces it. 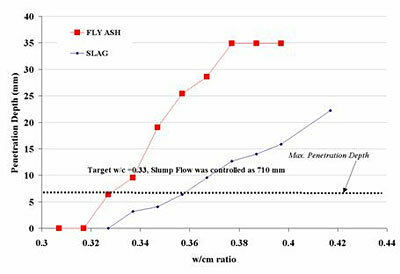 Banfill[viii] however reported that substitution of up to 60% of the cement by fly ash reduces the yield stress, but has little effects on the plastic viscosity. Carlsward, et al. [ix] have studied the effects of entrapped air, silica fume, limestone, and moisture on the rheological properties. It has been shown that the air content increases the slump flow, reduces the plastic viscosity, but has little effect on the shear stress. Silica fume thickens the mixture, the shear stress is substantially increased, the plastic viscosity is moderately increased, and the slump flow is strongly decreased. By contrast, limestone has little effects on the plastic viscosity and the slump, but increases the shear stress. Similarly, Assaad and Khayat,[x],[xi] showed that incorporation of pozzolanic materials such as the silica fume, fly ash, and blast furnace slag can increase internal friction of the cement paste and the shear stress. In addition, the mean interparticle distance play a significant role on the flow characteristics of SCC as it affects the rheological properties and the capacity to flow through obstacles. Higher aggregate content increases the yield stress and viscosity, so does aggregate with high aspect ratio. [xii] Similarly Assaad and Khayat[xiii] showed that an increase in the coarse-to-fine aggregate ratio and an increase of size of aggregate bring about a significant increase in the rate of stiffening. Bonen and Shah reported on the effects of the superplasticizer content, coarse aggregate-to-cement ratio, and fine aggregate-to-coarse aggregate (c:f) ratio on the flow properties of concrete. 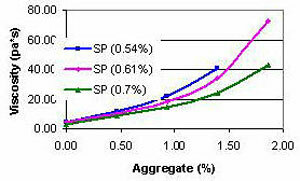 It was shown that for any content of superplasticizer-to-binder (SP:b) ratio, the slump flow increases as the aggregate-to-binder (agg:b) ratio decreases (Fig 1). Similarly, the robustness of the flow is proportioned to the agg:b volume and SP:b wt%. In addition, Ye, et al. [xiv] showed that the fluidity can easily be manipulated by changing the c:f ratio, and the slopes of curves are about the same for the powder-type and VMA-type SCC (Fig 2). Provided the aggregate is spherical, the beneficial role of fine aggregate is related to its ball-bearing effect. Khayat et al. showed that the use of coarse aggregate and sand combinations that enable the increase in packing density can reduce the superplasticizer demand and plastic viscosity of SCC. This was especially the case for concrete with low water-to-binder (w:b) ratio of 0.33. The increase in paste volume is also shown to reduce the plastic viscosity of SCC. Similar to the fluidity, the viscosity is readily changed by changing the superplasticizer and aggregate contents (Fig. 3). The effects of the latter on viscosity cannot be overlooked as the effects are as important as the role of superplasticizer. The figure also shows that the effect of aggregate on viscosity is exponential. Clearly, all these ingredients, especially water, superplasticizer, and aggregate, affect the rheological properties differently. Thus, in order to minimize variations that stem from small changes in quantities of these ingredients in successive batches, it is advantageous to add VMAs (viscosity-modifying admixtures) to the mixtures as even small additions of VMA considerably increase the plastic viscosity and cohesion of the mixture. VMAs are often water-soluble polymers or inorganic substances with very high surface area that bind water upon mixing. A review on the effects of the various VMAs is given elsewhere. [xv] Addition of VMA counters the strong adverse effects of small variations in the water and superplasticizer contents, and the contents of the other ingredients. Indeed, Shi, et al. [xvi] has shown that the flow loss of VMA-free mixtures is higher than in VMA mixtures. The high flowability and deformability of SCC derives from the characteristically low values of yield strengths and plastic viscosity. As an example, a typical yield stress of SCC is about one order of magnitude smaller than the corresponding yield strength of regular concrete. [xvii] These low yield stresses and plastic viscosity values inherently compromises the segregation resistance and countermeasures must be taken as discussed below. [i] Tattersall, G.H. and Banfill, P.F.G., The Rheology of Fresh Concrete, Pitman Advanced Publishing Program, Boston, London, Melbourne, 1983, p. 356. [ii] Banfill, P.F.G., “A Viscometric Study of Cement Pastes Containing Superplasticizers with a Note on Experimental Techniques,” Magazine of Concr. Res. 33(114), 37-47, 1981. [iii] Roy, D.M. and Asaga, K.,” Rheological properties of cement mixes: III The effects of mixing procedures on viscometric properties of mixes containing superplasticizers,” Cem. Concr. Res. 9, 731-739, 1979. [iv] Banfill, P.F.G., “A viscometric study of cement pastes containing superplasticizers with a note on experimental techniques,” Magazine of Concr. Res. 33 (114), 37-47, 1981. [v] Jones, T.E.R. and Taylor, S.A.,” Mathematical model for the flow curve of cement paste,” Magazine Concr. Res. 29 (101) 207-212, 1977. [vi] Douglas, R., Gregori, A., Sun, Z., Bonen, D. and Shah, S.P., “The Effect of ingredients and shear history on the thixotropic rate of rebuilding of SCC,” pp. 591-596 in 2nd North American Confer. & 4th Intern. RILEM Confer. On Self-Consolidating Concrete, Chicago, 2005. [vii] Cyr, M., Legrand, C. and Mouret, M.,” Study of the shear thickening effect of superplasticizers on the rheological behaviour of cement pastes containing or not mineral additives.,” Cem. Concr. Res. 30, 1477-1483, 2000. [viii] Banfill. P.F.G.,” An experimental study of the effect of pfa on the rheology of fresh concrete and cement paste,” pp 161-171 in Proceedings, Intern. Symp. on the Use of pfa in Concrete, Leeds, eds. J.G. Cabrera and A.R. Cusens, University of Leeds, April 1982. [ix] Carlsward, J., Emborg, M., Utsi, S. and Oberg, P., “Effects of constituents on the workability and rheology of self-compacting concrete,” pp. 143-153, in Self-Compacting Concrete, Proceedings, 3rd Intern. RILEM Symp. Eds. O. Wallevik and I Nielsson, RILEM Publications S.A.R.L. August 17-20, 2003. [x] Assaad, J., Khayat, K.H., Mesbah, H., “Variation of formwork pressure with thixotropy of Self-Consolidating Concrete,” ACI Materials Journal, Vol. 100(1) 29-37, 2003. [xi] Assaad, J., “Formwork Pressure of Self-Consolidating Concrete – Influence of Thixotropy,” Doctoral Thesis, Université de Sherbrooke, 2004, 450 p.
[xii] Geiker, M.R., Brandl, M., Thrane, L.N. and Neilsen, L.F. “On the Effect of Coarse Aggregate Fraction and Shape on the Rheological Properties of Self-Compacting Concrete,” Cem. Concr. Agg. 24 3-6, 2002. [xiii] Assaad, J., and Khayat, K., “Effect of coarse aggregate characteristics on lateral pressure exerted by self-consolidating concrete,” ACI Materials Journal, Vol. 102(3) 145-153, 2005. [xv] Khayat, K.H., “Viscosity-enhancing admixtures for cement-based materials-an overview,” Cem. Concr. Composites, 20, 171-178, 1988. [xvi] Shi, C., Wu, Y., Shao Y. and Riefler, M.,” Comparison of two design approaches for self-consolidation concrete,” pp. 313-317 in 1st North American Confer. On the Design and Use of Self-Consolidating Concrete, Eds. S.P. Shah, J.A.Daczko and J.N. Lingscheit, November12-13, 2002. [xvii] Wallevik, O.H. and Nielsson, I.,“Self-compacting concrete- a rheological approach,” Proceedings of the International Workshop on Self-Compacting Concrete, Japan, 21 p., 1998. Aggregate segregation, which is also referred to as sedimentation, is controlled by the viscosity and yield stress of the mixture, the binder density, aggregate size, aggregate density, as well as the content of fines. This implies that the stability of SCC (of low yield stress) can be enhanced by increasing both the viscosity and density of the matrix and by decreasing the maximum size and density of the aggregate. It follows, that higher w:c ratio and/or SP:c ratio increase the susceptibility to segregation and vise-versa, lower w:c ratio and SP:c ratio increase stability and therefore robustness. Similarly, greater fines content increases robustness either because it increases the viscosity or increases the density of the matrix. Silica fume is an example of a viscosity modifier, and slag and limestone are examples of density modifiers. Aggregate particles in SCC may be regarded as discrete inclusions in a homogeneous matrix. Consequently, the tendency of the aggregate to segregate depends on the properties of both the aggregate and the homogeneous matrix. Large aggregate size and high density decreases stability and vise-versa. However, within common ranges of SCC mixtures and densities of aggregate, Bonen and Shah[i] argued that the most important factor that governs the rate of sedimentation is the aggregate size. In addition to w:cm ratio and VMA concentration, the stability of SCC depends on the total content of fines in the mixture. Khayat et al. reported that SCC can exhibit greater resistance to surface settlement when the content of total fines in the mixture (smaller than 80 µm) increases for mixtures with similar aggregate packing densities. This was especially the case for SCC made with medium to low content of binder. It should be noted that the resistance to segregation of the mixture during placing into the forms and after placing might not be the same, because the forces acting on the aggregate under these two conditions are not the same. Once the concrete has been placed in the forms and it is in a static state, the forces acting on the aggregate can be calculated from Stokes’ Law. However, during placing, and in particular during horizontal flow, an aggregate particle is subjected to additional forces; the mixture drag and vertical drag that help to keep the particle suspended in the mixture. The mixture drag is proportional to the square of velocity of the mixture and the square of the particle diameter, whereas, the vertical drag is proportioned to the velocity of the mixture and the aggregate shape. Consequently, as the velocity of the mixture is increased, the mixture stability is also increased. Based on this realization that the dynamic stability is less severe than the static stability, Bonen and Shah pointed out that that visual evaluation of segregation during slump flow is an inadequate measure for predicting the static stability. As noted, the sedimentation velocity of aggregate in a static mode in the formwork is proportional to the radius square of the aggregate, the differences in the specific densities of the aggregate and matrix, and inversely related to the viscosity of the matrix. Because the viscosity of the mixture cannot be too high (otherwise the mixture will not flow), the ability to control the sedimentation rate by increasing the viscosity is limited to certain ranges. Therefore, robustness can be achieved either by reducing the aggregate size or increasing the matrix density or a combination thereof. Figure 4 shows a plot of equal sedimentation rates of a 12.7 mm spherical aggregate with a density of 2.7 g/cm as a function of the matrix density and viscosity. Because the slopes of the sedimentation rates are highly negative, within the normal ranges of concrete densities, the density of the matrix has a greater effect on the sedimentation rate than the change in viscosity. Second, as the density is increased, the effect of viscosity becomes more prominent. Figure 4. 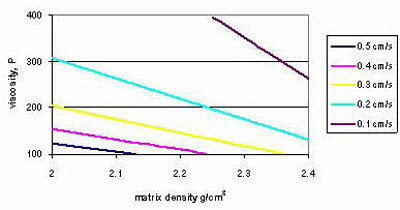 Calculated sedimentation rates of a 12.7 mm spherical aggregate with a density of 2.7 g/cm3 , CGS units (Bonen and Shah). Since incorporation of fines affects the density of the matrix, Fig. 4 also indicates that the sedimentation rate can be reduced by increasing the content of the fines with high specific density. Consequently, robustness increases by incorporation of density modifiers, and with regards to fines, the best density modifiers is slag, followed in decreasing order by ground dolomite, ground limestone, and ground quartz. By contrast, neither silica fume nor most types of fly ash can be considered as density modifiers. The density of fly ash varies over a large range, commonly from about 2 to 2.5 g/cm³ and that of silica fume is about 2.24 g/cm³. Thereby, in most cases, addition of fly ash and silica fume does not affect the matrix density. [i] Bonen, D. and Shah, S.P., ”The effects of formulation on the properties of self-consolidating concrete,” pp. 43-56 in Concrete Science and Engineering A Tribute to Arnon Bentur, International RILEM Symp. Eds. K. Kovler, J. Marchand, S. Mindess, and J. Weiss, RILEM Publications S.A.R.L. Evanston, USA, March 2004. [ii] Khayat, K.H. and Guizani, Z., “Use of viscosity-modifying admixture to enhance stability of fluid concrete,” ACI Mat. J. 1997, 94(4) 332-340. In this section, robustness is discussed vis-à-vis the sensitivity of concrete mixtures to undergo limited variations in concrete properties of successive batches due to some small changes in material characteristics and placement conditions. Under ordinary processing conditions, SCC representing high level of robustness implies that the concrete is less sensitive to changes in the characteristics of primary mixture constituents (sand fineness, aggregate gradation, sand humidity, characteristics of cementitious materials, etc.) on the filling ability, passing ability, and stability. A lack of robustness can result in significant bleeding and segregation when the water content is greater than the intended limit (for example, due to changes in sand moisture). A more robust SCC enables the concrete supplier to provide better consistency in delivering SCC that is less prone to inaccuracies in batching. This can reduce any intervention needed at the plant or job site to adjust the mixture. Typically, SCC made with low content of VMA and relatively low water content can represent greater robustness than SCC made with low binder content and higher dosage of VMA. In such mixtures, the VMA is used to reduce the variability of the SCC that can arise from changes in material properties and placement conditions. The incorporation of VMA controls bleeding and segregation and increases the robustness of the SCC, while the low water content provides mostly the required level of viscosity. Sakata et al. [i] reported that SCC made with low w:p ratio of 0.33 (powder containing limestone filler), the incorporation of a small concentration of welan gum of 50 g/m3 can reduce the variability in slump flow of SCC due to changes in cement Blaine (318 to 342 m2/kg), fineness modulus of sand (2.08 to 3.06), and temperature of fresh concrete (10 to 30°C). Hwang and Khayat[ii] suggested using the minimum water content (MWC) index to determine the robustness of SCC. The MWC is determined for concrete-equivalent mortar as the slope of the increase in flow diameter determined using a mini slump flow cone vs. the increase in w/cm. Concrete-equivalent mortar exhibiting greater MWC can result in lower degree of increase in flow after a given increase in water content, hence more robust. Mixtures made with naphthalene-based superplasticizer are shown to have greater robustness (greater RWD) than similar mixtures with polycarboxylate-based superplasticizer. The type of binder is also shown to affect RWD and robustness. [i] Sakata, N., Marruyama, K. and Minami, M., "Basic properties and effects of welan gum on self-consolidating concrete," RILEM Proceedings 32, Production Methods and Workability of Concrete, Paisely, Ed. Bartos, P.J.M., Marrs, D.L. and Cleland, D.J. (1996) 237-253. [ii] Hwang, S.-D., Khayat, K.H., Performance of Hardened Self-Consolidating Concrete Designated for Repair Applications, ACI SP-233 "Workability of SCC: Roles of It's Constituents and Measurement Techniques," Ed. Shi, C., Khayat, K.H., 2006. 2. If the natural moisture content of the aggregate is lower than SSD, then the amount of mixing water is increased. Mori et al. [i] examined mixes with 74 different types of aggregate and varying water absorption values. The authors concluded that the slump flow value tends to prominently decrease with an increase in natural moisture content of fine aggregate for mixtures with 0.35 w:c ratio as opposed to 0.5 w:c ratio. A strong influence on slump flow was observed by Sakai et al. [ii] when the amount of water was changed by + 5 kg/m2. These effects were reduced when a viscosity agent was added to these mixtures. Similar observations of slump flow variations were made by Ushijima, et al. [iii] They varied the amount of water added to the mixture in such a way so as to simulate a change of aggregate moisture content between -1% to +1.5%. According to their results, the slump flow increased nearly 100 mm when the aggregate surface moisture content was increased about 1%. Highuchi[iv] studied the effects of surface moisture of aggregates on concrete properties and the electric power consumed by the mixer. He observed that all the following parameter: viscosity, the power consumption of the mixer, and the O-funnel time increased with an increase in the surface moisture content of sand. The values of power consumption of the mixer were used by Nishizaki et al. [v] to adjust the composition of SCC which varied due to fluctuations in the moisture content of the fine aggregate. The above findings were recently confirmed by Deshpande[vi] who changed the SSD moisture condition of sand and pea gravel two folds from a completely dry state of aggregates to twice the water content of SSD. During the tests, the moisture content was varied in such way that sand and the pea gravel both had the same moisture content, i.e., either both were simultaneously in dry condition or both were in SSD condition. Due to these conditions, the w:cm ratio varied from 0.281 to 0.379. Figure 6 shows that the slump flow was reduced from about 790 down to about 670 mm, and even larger variations were recorded for the T50 test. The latter values varied from as low as 4s for mixtures cast with aggregates in dry condition and as high as 10s for mixtures cast with aggregates in 2 × SSD condition. The decrease in slump values observed in Fig. 6 is further augmented after some rest time. This phenomenon is attributed to the higher thickening rate of mixtures made at lower w:cm. Fig. 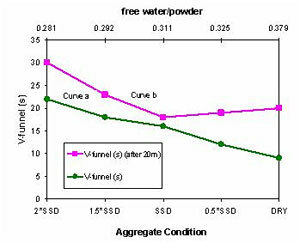 7 shows variations in V-funnel flow time measured either immediately after mixing (curve a) or 20 minutes after mixing (curve b) for mixes containing aggregate with different initial moisture content. It can be seen that when tested immediately after mixing, the V-funnel flow time for mixes with dry aggregate increases from 9s to 19s when tested at 0 and 20 minutes after mixing, respectively. For the same time intervals, the corresponding increase in the V-funnel flow time is only 2-second for mixtures with aggregates in the SSD condition. [i] Mori, H., Tanigawa, Y., Wakabyashi, S., and Yoshikane, T. (1996). "Effect of Characteristics of Aggregate on Properties of High-Fluidity Concrete." Transactions of the Japan Concrete Institute, 18, 53-60. [ii] Sakai, G., Shgematsu, K., Yurugi, M., and Sakata, N.; (1994). "Flow Stabilizing Properties of Special Viscosity Agent." The 37th Japan Congress on Materials Research. [iii] Ushijima, S., Harada, K., and Taniguchi, H. (1995). "Fundamental Study in the Practical Use of High Performance Concrete." Concrete Under Severe Conditions, E& FN SPON. [iv] Higuchi, M.; (1998). "State of the Art Report on Manufacturing of Self-Compacting Concrete." Proceedings of the International Workshop on Self-Compacting Concrete, Kochi, Japan, 360-367. [v] Nishizaki, T., Kamada, F., Chikamatsu, R., and Kawashima, H.; (1999). "Application of High-Strength Self-Compacting Concrete to Prestressed Concrete Outer Tank for LNG Storage." Proceedings of the First International Rilem Symposium on Self-Compacting Concrete, Stockholm, Sweden, 629-638. [vi] Deshpande, Y. S. (2006). "Development of Rapid-Setting Self-Compacting Concrete to Production Variabilities ", Purdue University. Emborg[i] concluded that the properties of SCC are more sensitive to both, deviation from the designed target and mixing technique. Due to high cementitious content, SCC typically requires longer mixing time compared to normal concrete, and it was noted that this might lead to a reduction in the capacity of the concrete plant, which might cause supply bottlenecks at the site. [ii] This longer mixing time is needed for securing complete structural breakdown of the SCC mixtures in order to utilize its superb flow properties. In general, concrete mixers can be classified as either a free fall type (tilting drum) mixers or forced paddle mixers, Emborg and Takada et al. [iii] The free fall mixers (also called drum mixers or gravity mixers) are predominantly used at larger plants in northern Europe and Southern Asia. The forced paddle mixers could be of two types: pan mixers (also called forced pan mixers) and pugmill mixers (also called mortar mixers in the USA). The pan mixers have a vertical axis of rotation and consist of cylindrical, horizontal pan (fixed or rotating) and one or two sets of rotating blades. The pugmill mixers typically consist of a horizontal drum and one or two rotating horizontal shafts with attached blades. Forced pan mixers have higher mixing efficiency than drum or mortar mixers (Deshpande and Olek,[iv] and Takada et al.). Takada et al. performed laboratory investigation of the effect of mixer type on fresh concrete properties of SCC and concluded that for the same composition and mixing sequence, tilting drum mixer increases the V-funnel flow times of SCC as compared to SCC mixed in pan mixer, and to achieve the same slump flow (650±30 mm), smaller amounts of superplasticizer (SP) were needed in the tilting drum mixer. By contrast, SCC produced in pan mixer was found to be prone to changes, which compromised the robustness of the mixtures. Similar trends were observed by Deshpande, 2006. Mixtures with the same w:p volume ratio were mixed in a mortar mixer and a conventional laboratory pan mixer. It was observed that for the same mixing sequence and mixing time, the mixtures produced using the pan mixer had higher viscosity as compared to the mixtures mixed in the mortar mixer. Mixtures mixed in the mortar mixer required lower dosages of polycarboxylate based superplasticizer to produce rapid-set SCC (RSSCC) with the same slump flow as compared to the dosages required for the mixtures mixed in the pan mixer. In turn, Emborg noted that the robustness is also a function of the mixer volume and in industrial full scale mixers, the variations in properties are smaller than those produced by laboratory mixers. [i] Emborg, M. (2000). "Final Report of Task 8.1." Proposal No0BE96-3801, 1-65. Higuchi, M.; (1998). "State of the Art Report on Manufacturing of Self-Compacting Concrete." Proceedings of the International Workshop on Self-Compacting Concrete, Kochi, Japan, 360-367. [ii] Lowke, D., and Schiessl, P.; (2005). "Effect of Mixing Energy on Fresh Properties of SCC." Proceedings of the Fourth International Rilem Symposium on Self-Compacting Concrete and Second North American Conference on the Design and Use of Self-Consolidating Concrete, Chicago, USA. [iii] Takada, K., Pelova, G. I., and Walraven, J.; (1998). "Influence of Mixing Efficiency on the Mixture Proportion of General Purpose Self-Compacting Concrete " International Symposium on High-Performance and Reactive Powder Cements Sherbrooke, Canada, 19-39. [iv] Deshpande, Y. S., and Olek, J.; (2005). "Effect Of Mixing Equipment And Mixing Sequence On Rapid -Setting Self-Consolidating Concrete." pp. in 2nd North American Confer. & 4th Intern. RILEM Confer. On Self-Consolidating Concrete, Chicago, 2005. The effect of mixing sequence and a mixing time on the properties of SCC were studied by Takada et al. using a gravity mixer (G) and a forced paddle mixer (F). It was reported that for the same water-to-powder ratio by volume (Vw/Vp), longer mixing times for 7.5 and 3.5 minutes in gravity mixtures required lower SP dosages and resulted in higher slump flow values and low V-funnel flow times as compared to shorter mixing times of 5.5 and 2.5 minutes. However, in the case of forced pan mixers, in order to obtain the same degree of deformability, mixtures that mixed for 5 minutes required higher dosages of SP than the corresponding mixtures with the same Vw/Vp that mixed for 3.5 minutes. While such results might not be representative, interpretation of the results suggests that it is not the mixing time, but rather the sheer energy and sheer rate that count. It is recognized that with a given mixture, completely different flow curves are obtained by varying these two parameters. The effect of delayed addition of SP on the slump flow and V-funnel time was studied by Domone and Jin. [i] In their study the delay in the time of addition of SP varied from zero to 6 minutes in increments of 1 minute. Fig. 8 shows the mixing sequence in which the powder, sand and 80% of the water were mixed for 2 minutes and then the SP and 20% of the water were incorporated. Three types of superplasticizers were used: naphthalene-based SP, melamine-based SP and polycarboxylic ether-based SP. It was observed that delayed addition increased the fluidity of the SP as measured by both the flow spread and V-funnel flow time. The optimum addition time ‘window’ was found to be 2 to 4 minutes for the naphthalene- and melamine-based admixtures, but 0 and 0.5 minutes for polycarboxylic-based admixture. Deshpande and Olek prepared 27 mixtures of RSSCC and found that the time in which the superplasticizer was added affects the rheological properties. 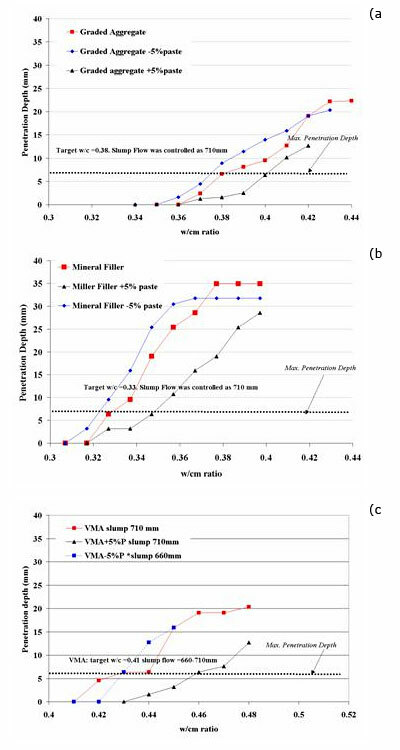 The results of this study indicate that early addition of superplasticizer enhances dispersion of cement and increased the flowability of the RSSCC mixture, especially for mixtures mixed in mortar mixer. Addition of silica fume also leads to reduction of the mixing time for mortar mixers. It was also observed that for the same w:p ratio and mixing sequence, the total mixing time in a mortar mixture was shorter that that in the pan mixer. Chopin and his co-workers[ii] studied the effects of mixing time on robustness. The parameters varied in the study included the quantity of powder, use of limestone filler, and various types and contents of silica fume and SP. The authors concluded that although the SCC mixtures generally require longer mixing times than conventional mixtures, their mixing time can be reduced by increasing the fine particle content, (with a constant w:c ratio), increasing the total water amount, and replacing part of the cement by silica fume. [i] Domone, P. L., and Jin, J.; (1999). "Properties of Mortar for Self-Compacting Concrete " Proceedings of the First International Rilem Symposium on Self-Compacting Conrete Stockholm, Sweden, 109-120. [ii] Chopin, D., Larrard de, L., and Cazacliu, B. (2004). "Why do HPC and SCC require a longer mixing time?" Cement and Concrete Research 34(12), 2237-2243. In the last two sections, the effects of the major ingredients on the stability of SCC are discussed. To reiterate, because of the inherent low values of yield stress and viscosity, SCC is especially prone to segregation under static conditions (Figs. 4 and 5). In view of the central role of segregation (that is manifested by sedimentation of aggregate as well as migration of paste and air voids to the top of the element and bleeding, several test methods have been proposed for evaluating the stability of the mixture. One popular method is based on visual stability index (VSI) of the slump flow of SCC and rating it visually from 0 to 3 in increments of 0.5, where a 0 rating represents no segregation and a rating of 3 represents severe segregation. [i] However, in accordance with Section 2.2, a visual inspection of slump flow is applicable to dynamic stability, but is an inadequate measure to evaluate the static stability of the mixture. 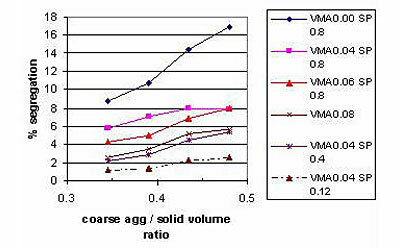 The robustness curves of the three base mixes made with graded aggregate, mineral filler, and VMA are compared in Figure 9. The mix design of the mixtures is given in Table 2. Figure 9. Effects of mix composition on robustness. The robustness increases in the order: mineral filler (fly ash), graded aggregate, and VMA. Figure 10. Effects of modest change in the paste content on the robustness of (a) graded aggregate, (b) mineral filler, and (c) VMA. Figure 10 shows the effects of a modest variation of the paste content by ±5% on robustness. For all the three types of SCC, the increase in the paste content increases robustness, whilst a decrease of the paste content decreases the robustness. It should be noted, however, that the VMA mixture with 5% less paste could not achieve the same slump flow. Higher paste content improves robustness because it increases the viscosity, density, and yield stress of the matrix. As discussed in Section 2.2, Fig. 11 shows the mixture with slag is more robust than with fly ash. [i] Interim Guidelines for the Use of Self-Consolidating Concrete in Precast/Prestressed Concrete Institue Member Plants, PCI, TR-6-03, 2003. [ii] Brameshuber, W. and Uebachs, S., “ The application of self-compacting concrete in Germany under special consideration of rheological aspects,” pp. 211-126, in 1st North American Confer. On the Design and Use of Self-Consolidating Concrete, November12-13, 2002. 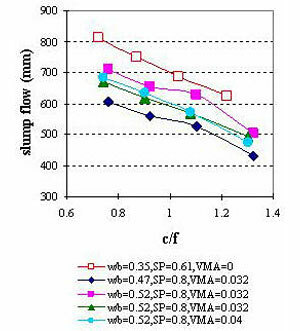 [iv] Bui, V.K., Montgomery D., Hinczak I., Turner K., “Rapid testing method for segregation resistance of self-compacting concrete”, Cem. Concr. Re.Vol 32, 1489-1496, 2002. [v] Bui, V.K. and Shah, S.P., “Rapid methods for testing quality of fresh self-consolidating concrete,” pp. 281-285 in 1st North American Confer. On the Design and Use of Self-Consolidating Concrete, November12-13, 2002. [vi] Shen, L., Struble, L. J., Lange, D., “Testing static segregation of SCC”, pp. 729-735 in 2nd North Amer. Conf. & 4th Int’l RILEM Conf. on Self-Consolidating Concrete, Chicago, 2005. [vii] Brinks, A. J., Lange, D. A., D’Ambrosia, M. D., and Grasley, Z. C., “A layered finite element model for the analysis of segregated concrete”, In draft. [viii] Jolicoeur, C., Khayat, K.H., Pavate, T.V., and Page, M., “Evaluation of Effect of Chemical Admixture and Supplementary Materials on Stability of Concrete-Based Materials Using In-Situ Conductivity Method,” pp. 461-483 in Superlasticizers and other Chemical Admixtures on Concrete, Proc. 6th CANMET/ACI Intern. Confer. SP-195, V. M. Malhotra, ed., American Concrete Institute, Farmington Hills, Mich., 2000. Self-consolidating concrete is an emerging technology that utilizes flowable concrete that eliminates the need for consolidation. Apart from regulation considerations, the growth of the SCC market share depends to a great extent on the robustness of the mixtures. Robustness depends on a number of different attributes including the mix design, shear energy, shear rate, and application. It implies that a given mixture can be regarded as robust for a lateral flow application, such as garage floor, but might segregate once it cast into tall columns. Similarly, because of thixotropy considerations, a robust mix that is successfully cast into columns might turn out to be a non-robust mix if it has a different mixing history. From all practical considerations (and in analogy to the flow requirements), it is the opinion of the authors that robustness should be evaluated according to the application. For example, for most lateral flow applications, the VSI method mentioned above is sufficient for rating the robustness of the mix. In more demanding applications, other quantitative methods listed above should be used. Robustness issues can be overcome if a greater attention is paid to the moisture variations in aggregate and carefully metering of all ingredients, especially chemical admixture and water. Higher robustness is achieved by increasing the viscosity of the mixture via materials selection and incorporation of more VMA and/or powder. In regard to the latter, incorporation of supplementary cementitious materials of high specific gravity, such as slag, dolomite, or limestone increases the robustness considerably. Bonen, D. and Shah, S.P., “Fresh and hardened properties of self-consolidating concrete,” Progress in Structural Engin. Mater. J.,Vol 7(1) 14-26, 2005. Khayat, K.H., “Workability, Testing and Performance of Self-Consolidating Concrete,” ACI Materials Jr., Vol 96(3) 346-353, 1999. Khayat, K.H., Hu, C. and Monty, H.,” Stability of SCC, advantages and potential applications,” in RILEM International Confer. on Self-Compacting Concrete, Stockholm, Sep. 1999. Tattersall, G.H. and Banfill, P.F.G., The Rheology of Fresh Concrete, Pitman Advanced Publishing Program, Boston, London, Melbourne, 1983, p. 356. Banfill, P.F.G., “A Viscometric Study of Cement Pastes Containing Superplasticizers with a Note on Experimental Techniques,” Magazine of Concr. Res. 33(114), 37-47, 1981. Roy, D.M. and Asaga, K.,” Rheological properties of cement mixes: III The effects of mixing procedures on viscometric properties of mixes containing superplasticizers,” Cem. Concr. Res. 9, 731-739, 1979. Banfill, P.F.G., “A viscometric study of cement pastes containing superplasticizers with a note on experimental techniques,” Magazine of Concr. Res. 33 (114), 37-47, 1981. Jones, T.E.R. and Taylor, S.A.,” Mathematical model for the flow curve of cement paste,” Magazine Concr. Res. 29 (101) 207-212, 1977. Douglas, R., Gregori, A., Sun, Z., Bonen, D. and Shah, S.P., “The Effect of ingredients and shear history on the thixotropic rate of rebuilding of SCC,” pp. 591-596 in 2nd North American Confer. & 4th Intern. RILEM Confer. On Self-Consolidating Concrete, Chicago, 2005. Cyr, M., Legrand, C. and Mouret, M.,” Study of the shear thickening effect of superplasticizers on the rheological behaviour of cement pastes containing or not mineral additives.,” Cem. Concr. Res. 30, 1477-1483, 2000. Banfill. P.F.G.,” An experimental study of the effect of pfa on the rheology of fresh concrete and cement paste,” pp 161-171 in Proceedings, Intern. Symp. on the Use of pfa in Concrete, Leeds, eds. J.G. Cabrera and A.R. Cusens, University of Leeds, April 1982. 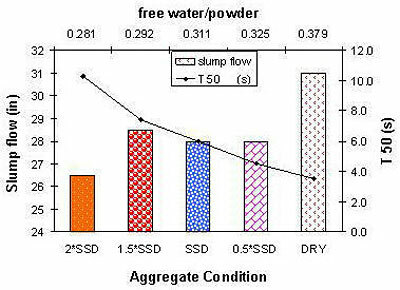 Carlsward, J., Emborg, M., Utsi, S. and Oberg, P., “Effects of constituents on the workability and rheology of self-compacting concrete,” pp. 143-153, in Self-Compacting Concrete, Proceedings, 3rd Intern. RILEM Symp. Eds. O. Wallevik and I Nielsson, RILEM Publications S.A.R.L. August 17-20, 2003. Assaad, J., Khayat, K.H., Mesbah, H., “Variation of formwork pressure with thixotropy of Self-Consolidating Concrete,” ACI Materials Journal, Vol. 100(1) 29-37, 2003. Assaad, J., “Formwork Pressure of Self-Consolidating Concrete – Influence of Thixotropy,” Doctoral Thesis, Université de Sherbrooke, 2004, 450 p.
Geiker, M.R., Brandl, M., Thrane, L.N. and Neilsen, L.F. “On the Effect of Coarse Aggregate Fraction and Shape on the Rheological Properties of Self-Compacting Concrete,” Cem. Concr. Agg. 24 3-6, 2002. Assaad, J., and Khayat, K., “Effect of coarse aggregate characteristics on lateral pressure exerted by self-consolidating concrete,” ACI Materials Journal, Vol. 102(3) 145-153, 2005. Khayat, K.H., “Viscosity-enhancing admixtures for cement-based materials-an overview,” Cem. Concr. Composites, 20, 171-178, 1988. Shi, C., Wu, Y., Shao Y. and Riefler, M.,” Comparison of two design approaches for self-consolidation concrete,” pp. 313-317 in 1st North American Confer. On the Design and Use of Self-Consolidating Concrete, Eds. S.P. Shah, J.A.Daczko and J.N. Lingscheit, November12-13, 2002. Wallevik, O.H. and Nielsson, I.,“Self-compacting concrete- a rheological approach,” Proceedings of the International Workshop on Self-Compacting Concrete, Japan, 21 p., 1998. Bonen, D. and Shah, S.P., ”The effects of formulation on the properties of self-consolidating concrete,” pp. 43-56 in Concrete Science and Engineering A Tribute to Arnon Bentur, International RILEM Symp. Eds. K. Kovler, J. Marchand, S. Mindess, and J. Weiss, RILEM Publications S.A.R.L. Evanston, USA, March 2004. Khayat, K.H. and Guizani, Z., “Use of viscosity-modifying admixture to enhance stability of fluid concrete,” ACI Mat. J. 1997, 94(4) 332-340. Sakata, N., Marruyama, K. and Minami, M., "Basic properties and effects of welan gum on self-consolidating concrete," RILEM Proceedings 32, Production Methods and Workability of Concrete, Paisely, Ed. Bartos, P.J.M., Marrs, D.L. and Cleland, D.J. (1996) 237-253. Hwang, S.-D., Khayat, K.H., Performance of Hardened Self-Consolidating Concrete Designated for Repair Applications, ACI SP-233 "Workability of SCC: Roles of It's Constituents and Measurement Techniques," Ed. Shi, C., Khayat, K.H., 2006. Mori, H., Tanigawa, Y., Wakabyashi, S., and Yoshikane, T. (1996). "Effect of Characteristics of Aggregate on Properties of High-Fluidity Concrete." Transactions of the Japan Concrete Institute, 18, 53-60. Sakai, G., Shgematsu, K., Yurugi, M., and Sakata, N.; (1994). "Flow Stabilizing Properties of Special Viscosity Agent." The 37th Japan Congress on Materials Research. Ushijima, S., Harada, K., and Taniguchi, H. (1995). "Fundamental Study in the Practical Use of High Performance Concrete." Concrete Under Severe Conditions, E& FN SPON. Nishizaki, T., Kamada, F., Chikamatsu, R., and Kawashima, H.; (1999). "Application of High-Strength Self-Compacting Concrete to Prestressed Concrete Outer Tank for LNG Storage." Proceedings of the First International Rilem Symposium on Self-Compacting Concrete, Stockholm, Sweden, 629-638. Deshpande, Y. S. (2006). "Development of Rapid-Setting Self-Compacting Concrete to Production Variabilities", Purdue University. Emborg, M. (2000). "Final Report of Task 8.1." Proposal No0BE96-3801, 1-65. Lowke, D., and Schiessl, P.; (2005). "Effect of Mixing Energy on Fresh Properties of SCC." Proceedings of the Fourth International Rilem Symposium on Self-Compacting Concrete and Second North American Conference on the Design and Use of Self-Consolidating Concrete, Chicago, USA. Takada, K., Pelova, G. I., and Walraven, J.; (1998). "Influence of Mixing Efficiency on the Mixture Proportion of General Purpose Self-Compacting Concrete " International Symposium on High-Performance and Reactive Powder Cements Sherbrooke, Canada, 19-39. Deshpande, Y. S., and Olek, J.; (2005). "Effect Of Mixing Equipment And Mixing Sequence On Rapid -Setting Self-Consolidating Concrete." pp. in 2nd North American Confer. & 4th Intern. RILEM Confer. On Self-Consolidating Concrete, Chicago, 2005. Domone, P. L., and Jin, J.; (1999). "Properties of Mortar for Self-Compacting Concrete " Proceedings of the First International Rilem Symposium on Self-Compacting Conrete Stockholm, Sweden, 109-120. Chopin, D., Larrard de, L., and Cazacliu, B. (2004). "Why do HPC and SCC require a longer mixing time?" Cement and Concrete Research 34(12), 2237-2243. Interim Guidelines for the Use of Self-Consolidating Concrete in Precast/Prestressed Concrete Institue Member Plants, PCI, TR-6-03, 2003. Brameshuber, W. and Uebachs, S., “ The application of self-compacting concrete in Germany under special consideration of rheological aspects,” pp. 211-126, in 1st North American Confer. On the Design and Use of Self-Consolidating Concrete, November12-13, 2002. Japan Society of Civil Engineers, Recommendation for Self-Consolidating Concrete, T. Omoto and K. Ozawa, eds., JSCE Concrete Engineering Series 31, 1999, pp.77. Bui, V.K., Montgomery D., Hinczak I., Turner K., “Rapid testing method for segregation resistance of self-compacting concrete”, Cem. Concr. Re.Vol 32, 1489-1496, 2002. Bui, V.K. and Shah, S.P., “Rapid methods for testing quality of fresh self-consolidating concrete,” pp. 281-285 in 1st North American Confer. On the Design and Use of Self-Consolidating Concrete, November12-13, 2002. Shen, L., Struble, L.J., Lange, D., “Testing static segregation of SCC”, pp. 729-735 in 2nd North Amer. Conf. & 4th Int’l RILEM Conf. on Self-Consolidating Concrete, Chicago, 2005. Brinks, A. J., Lange, D. A., D’Ambrosia, M. D., and Grasley, Z. C., “A layered finite element model for the analysis of segregated concrete”, In draft. Jolicoeur, C., Khayat, K.H., Pavate, T.V., and Page, M., “Evaluation of Effect of Chemical Admixture and Supplementary Materials on Stability of Concrete-Based Materials Using In-Situ Conductivity Method,” pp. 461-483 in Superlasticizers and other Chemical Admixtures on Concrete, Proc. 6th CANMET/ACI Intern. Confer. SP-195, V. M. Malhotra, ed., American Concrete Institute, Farmington Hills, Mich., 2000.